I studied life sculpture at San Diego State University. Since moving to New Jersey in 1998, I have been furthering my studies, translating the natural world into three-dimensional sculptures in clay. I believe that education should never stop and went back to school to receive a degree in teaching. In figurative sculpture, I have made it my focus to capture a mood through the myriad of expressions that cross the human face and body. It can be seen in the sensual curve of a woman’s back or the slight tilt of a child’s chin, conveying a silent language in all its complexities. Small nuances in the face and body sometimes speak much more powerfully to us than words could ever convey. My desire is to get the viewer to contemplate what that particular piece might be “saying” to them. The emotional response will likely vary since we all have our own unique way of seeing the world around us. Inspired by the classic human form, I began working with water-based clay because it was so organic and pliable. It does have its limits, though, and in an effort to achieve more detail in my work, I began using plasteline clay. This allowed me to work on the piece much longer without any cracking or drying out. It is also much easier to go to the mold making process from there. The works can be cast in bronze, urethane, stone, plaster, and many other mediums. Bronze, obviously, being the most expensive way to go. The patina process, which is one of my favorite parts, is what helps bring the piece to life. My artwork has been exhibited in many regional shows including the Riverdale Art Gallery, Catherine Lorillard Wolfe Art Club, Inc., Ridgewood Art Institute, Lambert Castle, William Paterson Power Arts Gallery, and others. 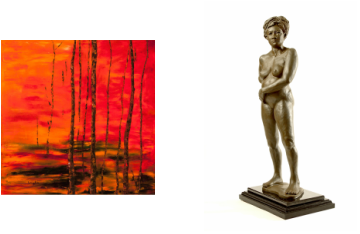 Memberships include National Sculpture Society, The Catherine Lorillard Wolfe Art Club, Clifton Art Assoc., and Salute to Women in the Arts. My works are in many private collections around the United States.